Who knew I'd miss the mark so badly when I pencilled in who would make the Lucky 6? Neither Shifa nor Rashmi made the cut. Instead the judges picked two boys - Padmanav and Suhit Gosain (thanks Alisha, I'll send my ear damage bills to you). They then added Ankita Mishra (thanks probably to Udit Narayan). The rest were easy to predict so I don't get any special points - Amit Paul, Bhavin Dhanak, Aisha Sayed and Shantanu Sudame all made the cut. And as it turns out the public eliminated the best candidates the judges put back on the roster. Aisha, Bhavin and Shantanu: out. Suhit Groan-sain still in. While we wait for the last two who will make it in the final 13, here is how they have fared. Amit Paul sang beautifully as always and even added some much needed excitement to his singing by picking up R.D. Burman's "Dil Lena Khel". Then in his next performance he fumbled the lyrics. Ouch! Not looking good for the only true voice left in the Lucky 7. Padmanav has been a revelation so congratulations to the judges for picking him. His choice of A. R. Rahman's "Vande Matram" was shrewd because it always gives audiences a rise. But he still had to go and sing it and he delivered in spades. Another suprise has been Ankita Mishra. She sang two songs - one a bhajan - wildly different in styles, handled the highs, lows and vocal jiggles with hardly a mistake. 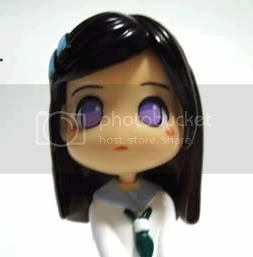 She's so adorable that I'm glad she's around. Which leads me to the last contestant. All I'll say is: Suhit, Tom Araya called again. He says your records are scratched - stop imitating that stuff. I really don't get why Aisha keeps getting voted off. At first, I thought it was a fluke and people weren't really voting yet because the competitio hadn't really started, but now it's just weird. Aspi: I like your blog, pretty close to how I think/analyze (atleast the singing contests). 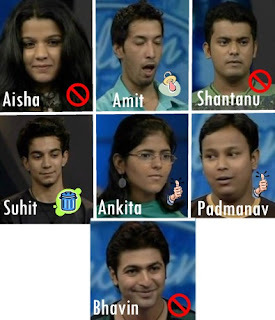 I thought Shantanu was also voted out along with Aisha & Bhavin. About Sohit: You said it well. Javed Aktar also said it well when he compared the singing to a luxurious/stylish car, with bells and whistles, that cannot work. His attitude is suspect, I hope he is more graceful in his exit, whenever that happens(again). Parting line: I feel Abhishek is the dark horse. Lena, it confounds me too. She's good looking, has a unique voice but just not a lot of friends with a mobile? mad munky (great name): I hope so too! S, thanks and quite right about Shantanu. I updated my post. I think audiences like Abhishek too. I had expected Shantanu, Amit, Aisha and Bhavin to be back via the wild card entry. I had hoped Harshida would be back as she sings well and has great stage presence aleast more than Suhit!!! Alisha who has been commenting on personality factor of Smita thinks Suhit has great stage presence. Suhit cant even move! he sings in the same position all the time and there is no versatility in his style! I liked Suhit in the top 28 as he style is "thoda hatke" but now the competion is so strong, style is just not enough, you should be able to actually sing! My mind is baffled at the judges decision to chose Suhit against some of the competent singers (I sense Javedji and Uditji had nothing to do with the choice here). While I feel bad for Suhit as a person (not a nice thing to hear someone say things like that to you), I totally agree with Javedji on comments to Suhit. If the selection of top 7 wasnt shocking enough the janta voted out the top 3 contestants. I mean Aisha a unique voice, with singing talent and great stage presence, how could public choose Suhit over her is beyond me. Padmanav has really surprised me, his singing was awesome for the last 2 performances. Bhumi, you are dead right. Where is the "performance" Suhit is putting up each time? The boy doesn't even move his feet! Bhumi, there's a cynical part of me that thinks that the judges do not have full control over their choices. In other words there are producers and such behind the scenes who partially determine the inclusion of the likes of Suhit Gosain in the Seven. After all they might decide to add some dhamaaka to the dynamics. After that, all I can say is that too many people must have cell phones and free time on their hands in Gurgaon to have voted Suhit in. To paraphrase Javed Akhtar, "..chalti kaa naam gaadi" but sad to say, Suhit Gosain is not even a bullock cart. I know Bhavin & Aisha were awesome singers but Suhit is also great HE has a spark in him. He just Burns the stage. Anyway he is out and I am sure you guyz are very happy. I am happy that Amit got Selected but SUHIT ROCCCCCCKS!! Suhit u rocked d show man....U R D BEST!!!!!!! !wished u stayed till d galas atleast.